Hmm. What do u think? RT @cryptho2000: We have to distinguish talent from the simply prolific. Having said that, how do we qualify 'talent'? 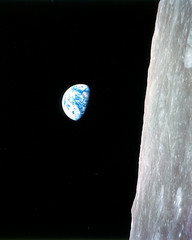 Earthrise Seen for the First Time By Human Eyes. Taken by William Anders in 1968. Printed in 1999 for the series Full Moon by Michael Light. I hadn’t considered that the question of editing and art applies beyond a single person’s output. I had only really thought about it with regard to photographers like Charles Cushman or Vivian Maier and how, having access to only their unedited work, whether or not they are indeed artists. Quoting my previous post. Photography is unique among the arts in that discards are both preserved and often indistinguishable from keepers. The print is the final state, but everything is stored as negatives. This also puts photography in the position where it is possible to have multiple edits of a photographer’s work which end up portraying the photographer in completely different ways. The NASA photo archive coupled with Michael Light’s Full Moon series proves that I need to think beyond a single photographer’s work when considering the question of editing. The NASA archive is huge. The photos in it are taken for documentary purposes by engineers and scientists. Michael Light however has gone through the archive, picked certain images, rescanned them, and produced something which is worthy of display in an art museum. The best advice for any photographer is to distill the composition down to the essence of what, exactly, is interesting about the subject. While the NASA photos consist of images made by many different photographers, the best ones share this purity of photographic purpose. The story behind Earthrise is that despite being up in space and orbiting the moon, the single most impressive, beautiful, important thing they saw was Earth. The result is arguably* the most important photo ever taken. *I tend to argue for others but I completely agree that Earthrise belongs in the discussion. It’s amazing to think that photography wasn’t even considered to be part of the original purpose of an astronaut’s mission. John Glenn took a camera up with him as part of his personal allowance and took photos of what he found interesting. It didn’t take long for photography to become part of the official mission. Orbital sunset photographed by Astronaut John H. Glenn Jr. aboard the “Friendship 7” during his Mercury-Atlas 6 (MA-6) flight. 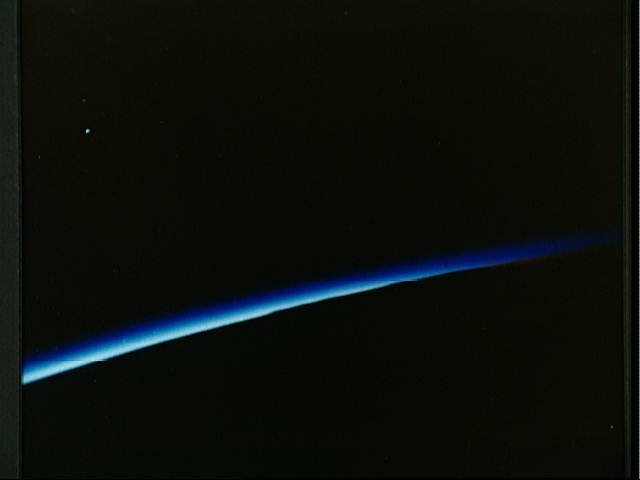 Image from NASA Image Archive. Despite the quality and importance of the photos, it’s telling that no one really cares which astronaut took a given photograph. Space photos all end up being about NASA and NASA’s directive rather than the specific photographer. This is very different from photographs taken by other government agencies using already-established (and now famous) photographers. 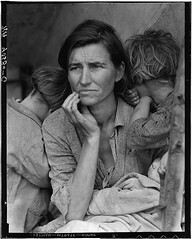 AKA Migrant Mother by Dorothea Lange. While the NASA photos can definitely be art, it took some curation by an external party to get them into a museum. 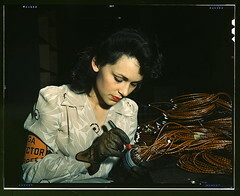 Earlier government-sponsored photographs however have been in museums for decades. Because the photographers are famous, most people aren’t even aware that the government was responsible for the photos. And because the photographers had more control about the curation of their work at the time, the resulting presentation has been static for 65–75 years. Another quote from my previous post. Does the fact that someone else can edit your body of work to make you look like an artist actually make you an artist? How much of being an artist means editing your own work? I’m inclined to say that it doesn’t matter who the editor is, just that it’s not art until someone has actually edited it. It’s not art until someone has edited it. Dishing out artistic credit when the creator and the editor are different is a difficult concept. We’re not used to art being like that. But the idea that the artist has to do the editing rules out a lot of things from becoming art. It also preëmpts the idea of going back and re-editing an already edited work. As access to government photo archives increases, it will be interesting to see if any projects similar to Full Moon are published. If they are, the logical next step will be to take the same approach to an individual photographer’s negatives—for example, re-making The Americans using different frames from those Robert Frank selected. And it will be especially interesting to see how photographers respond to the idea and how credit is divvied up. This entry was posted in books, museums, photography, SFMOMA, twitter. Bookmark the permalink. Was Carver not Carver until he was edited? Or was the real Carver something else altogether? Carver though was able to discuss the edits with the editor. The idea of releasing a second “author’s” cut after the fact is much more interesting. I can’t help wondering if this kind of thing is caused by the “director’s cut” phenomenon. We’ve also had Let It Be… Naked which does the same thing. My main interest though is in the editing of a collection without really consulting the original creator(s). So far, it’s been to collections which may not have been thought of as art at the time, but with editing, became art decades later. But I’m curious whether we’ll see the same phenomenon grow. Two photo collections from the Library of Congress which I’d love to see edited down to an art book are the Gottlieb Jazz Photos and the 1930s-40s in Color. What a concept — the depression in color. All this time we thought we only began seeing in color during the 50s. At least, that’s what Calvin’s Dad said. Checked out the John Muir exhibit at History Park today – a great example that ties right into your discussion. John Muir’s name is on the exhibit – but he just collected the specimens. Lab rats did all the work of preserving and isolating them for herbaria; decades later others spent dozens of hours making/manipulating digital images of the mounted specimens. And a curator selected the images for the traveling exhibit. Stunning work – but is it art? If so, who’s the artist? Not a reply but a ps: Clarification – that’s dozens of hours per print. Actually, those photos by Dorothea Lange, taken when she was working for the FSA, weren’t attributed to her at first (nor were other images by FSA photographers). If you look at the places where the images were initially published by the government and the press, in the 30s and even into the 40s, most do not identify the photographer, and only acknowledge the government. It was only after several of the photographers were recognized for their artistry in the arts world (through exhibitions and publication in arts magazines) that their names started getting attached to their images in the press. Your post made me think also about the role of the photo editor. Many of the FSA photos were re-printed over and over throughout the late 30s and 40s, placed in different contexts, with different croppings, in re-assembled into different photo collages and photoessays within magazines like Life, photo books, and even exhibitions (c.f. The Family of Man exhibition: http://en.wikipedia.org/wiki/The_Family_of_Man). Even though many of these were not in museums, I think there is still a curation happening. Yup yup. One of the nice things about the internet is that it’s destroyed the idea that curation can only be done in museums. So we can start rethinking how things have been presented to us in the past as well.